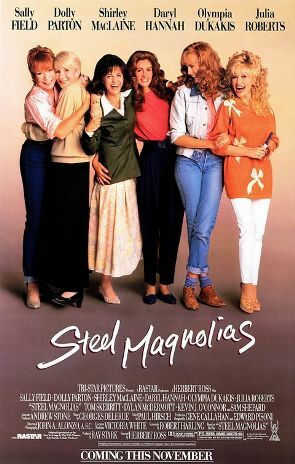 Steel Magnolias is a classic chick-flick with all star cast, including Julia Roberts, Sally Field, Dolly Parton, Daryl Hannah, Olympia Dukakis and my personal favourite, Shirley MacLaine as Ouiser. We all know people like that. Maybe we’re one of them. Where does such a personality come from? Evidence suggests that it’s a combination of disposition and characteristic thinking patterns, or ways of interpreting the world. While we may have little control over the former, we can do a lot about the latter. Negative thinkers make everything smaller. They limit, constrict, and control, until their worlds become half an inch wide. Just being around them makes you tired. It can feel like walking through cement with a plastic bag over your head. How do we counterbalance this tendency? By engaging in thinking patterns that allow us to work with possibilities rather than limitations. We all have the potential to engage in either negative or positive thinking patterns, and regrettably, our factory-installed setting is all too often toward negative thinking. It takes effort to shift our perceptions, but over time, it gets easier and easier. We can actually rewire our brains to favour the positive track. Moderation in all things, though, including moderation. There are times when it’s perfectly appropriate to engage in cautious, even negative thinking. When preparing our tax return, for example. An excess of optimism can lead us to overlook some very important facts. But on balance, optimism has a lot of advantages as a default setting. It gives us durability and resilience, and is fundamental to our mental health. People who engage in optimistic thinking bounce back from setbacks, are better able to attain their goals and are open to the world along the way. Their lives are fuller, richer and they’re just a heck of a lot nicer to be around.